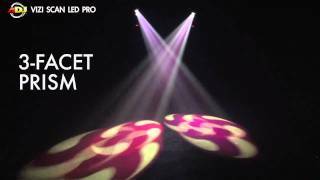 The Vizi Scan LED Pro is a high performance DMX Scanner that features two effects in one: A hard edge spot beam or a frost (wash) effect! This fixture is powered by a high output 50W long life LED source (6500°K, 60,000 hr.) with a low power draw of 130W. This unit is compact & light weight and offers plenty of pro features such as: 8 Dichroic Colors + white (includes UV), 7 Rotating Gobos (Interchangeable) a Prism Wheel with 3-facet and Infinite prisms, Remote Focus, Gobo Indexing, Dimming (0-100%), Strobe effect, 2 DMX channel modes (12 or 14 Ch.) and a Gobo Scroll mode. The Vizi Scan LED Pro also features the SLOCK™ - Slide Lock gobo changing system - that makes removing and installing gobos much easier. Considering purchasing the American DJ Vizi Scan LED Pro 50W LED Scanner? Have questions? Ask people who've recently bought one. Do you own the American DJ Vizi Scan LED Pro 50W LED Scanner? Why not write a review based on your experience with it. 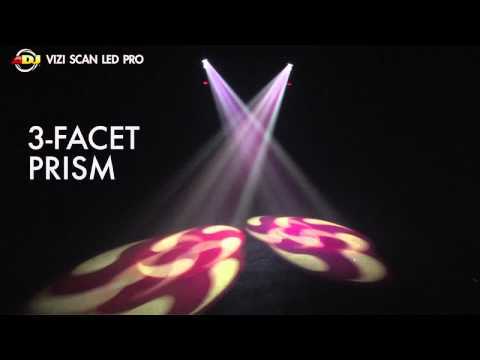 Seen a video for American DJ Vizi Scan LED Pro 50W LED Scanner online or have you own video? You will earn 2,108 loyalty points with this product worth £5.27, when logged in. Check out American DJ Vizi Scan LED Pro 50W LED Scanner on DJkit.com!